The second installment of the Hary Potter series begins with Harry ruining a dinner party at the Dursley's when a house elf named Dobby arrives suddenly to warn him from returning to Hogwarts. But return he does, in a flying car that Ron steals from his father and lands, ungracefully, in the Whomping Willow. This year sees a new Defense Against the Dark Arts teacher, the insufferable Gilderoy Lockhart, who is incredibly vain and self-centered. 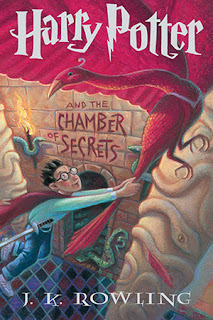 A series of petrifications rocks the school, apparently related to the opening of a mysterious Chamber of Secrets. 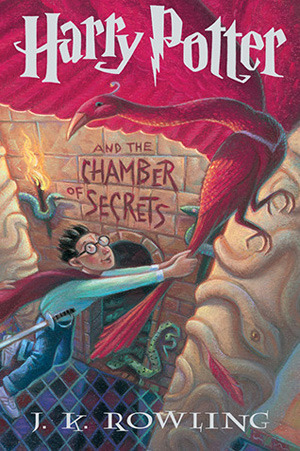 I had forgotten that this was the book in which Harry discovers Tom Riddle's diary; I somehow thought that came later. I did remember that it was the book with the spiders though. We are also introduced to Dobby, as I mentioned, and learn more about the death of resident ghost Moaning Myrtle. When Harry discovers that the caretakers cat, Mrs. Norris, has been petrified, his placement on the scene causes a lot of suspicion. A message on the wall says that the Chamber of Secrets has been opened and that the heir of Slytherin will kill students who aren't of pure wizard blood. Harry's ability to speak Parseltongue and his near-brush with being placed in Slytherin cause him to doubt himself and wonder if somehow he is involved with the attacks. The distrust among students as they raced to solve the mystery created a great deal of delicious, delicious tension. Gilderoy Lockhart is the sort of character you love to hate. His reading list for Defense Against the Dark Arts consists of the many memoirs he has written bragging of his exploits. He immediately takes to Hermione, as she is the only one who has read the books, and she continues to admire him even though he is completely inept. It was all just so much fun! I'm really looking forward to Harry Potter and the Prisoner of Azkaban. This is where the books begin to get much longer so it will be a challenge for me on audio, but I think I'm up to it!